A home is the biggest purchase you'll ever make, so it's important to understand the condition of your investment. Let the experts at Associated Inspectors provide the thorough inspection you expect and a report you can rely on to make a confident decision. We are Nevada-Certified Residential & Commercial Inspectors and Certified Master Inspectors® trained by InterNACHI-the International Association of Certified Home Inspectors. With 50 years' experience in construction and inspections, we are familiar with all types of homes and buildings in southern Nevada, and we have the hands-on knowledge to spot problems with materials, installation and workmanship that other inspectors might miss. Whether you need a residential or commercial property inspection or want information about your home or business's energy efficiency, let Associated Inspectors give you the peace of mind you deserve. Watch the video to find out what it can do for you. Richard Cummins, Owner of Associated Inspectors. 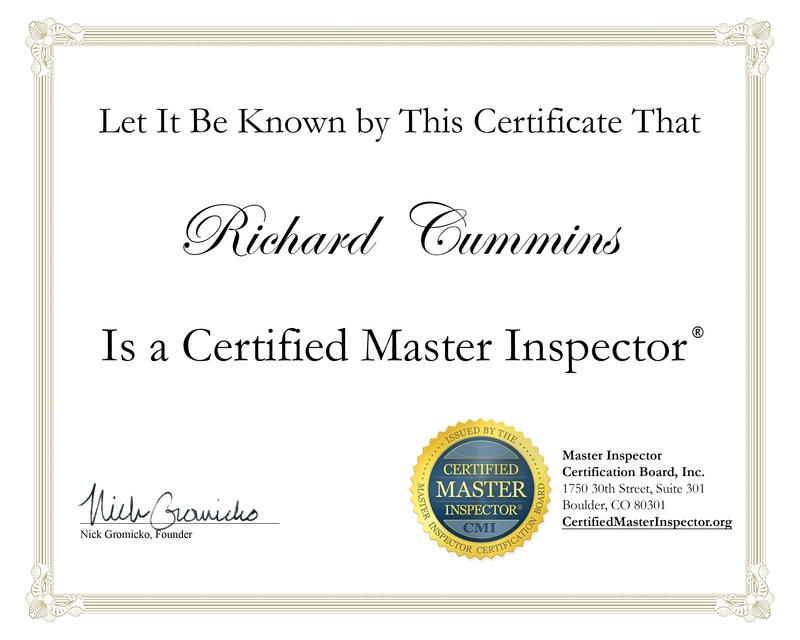 CMI (Certified Master Inspector). We cover the greater Las Vegas area to include, Henderson, North Las Vegas, NV and everywhere in between. In 1997 Richard started Associated Inspectors, Inc., now a multi inspector firm. As a lead instructor for Kaplan Professional Schools, he trained home inspectors and realtors about property inspections. He is a founding member of the Southern Nevada Association of Professional Property Inspectors and has served as President, Vice-President, and Treasure. He assisted the State of Nevada in writing NRS & NAC 645D regulations which govern the home inspection and energy industry. InterNACHI is a U.S.-based, non-profit professional association for home inspectors. Founded in 1990 by Nick Gromicko and headquartered in Boulder, Colorado, InterNACHI is the largest home inspection association in the world, with more than 12,000 members located in all 50 states, eight Canadian provinces, and 32,400 other members in some 65 other countries. Members are required to adhere to the InterNACHI Standards of Practice and Code of Ethics. Its website is over 235,000 pages long and gets 260 million hits per year. BPI develops standards for energy efficiency retrofit work using an open, transparent, consensus-based process built on sound building science. From these standards, we develop professional certifications for individuals, companywide credentials for BPI GoldStar Contractors, home energy rating systems and quality assurance services that help raise the bar in home performance contracting. International Code Council is the largest building and safety code organization dedicated to protecting the property, health and safety of people worldwide. FLIR infrared cameras make it easy to perform non-destructive inspections that isolate cold and warm air infiltration/exfiltration so necessary repairs and improvements can be made to tighten energy efficiency. FLIR thermal imagers can also instantly show temperature differences that verify what’s wet and what’s dry and are the IR inspection cameras preferred most by building experts for fast, reliable diagnosing of a full range of building applications. Whether you need a residential or commercial property inspection or want information about your home or business's energy efficiency, contact Associated Inspectors offering professional inspection services across Las Vegas, Henderson, Summerlin, Mountain's Edge, Green Valley and surrounding areas.